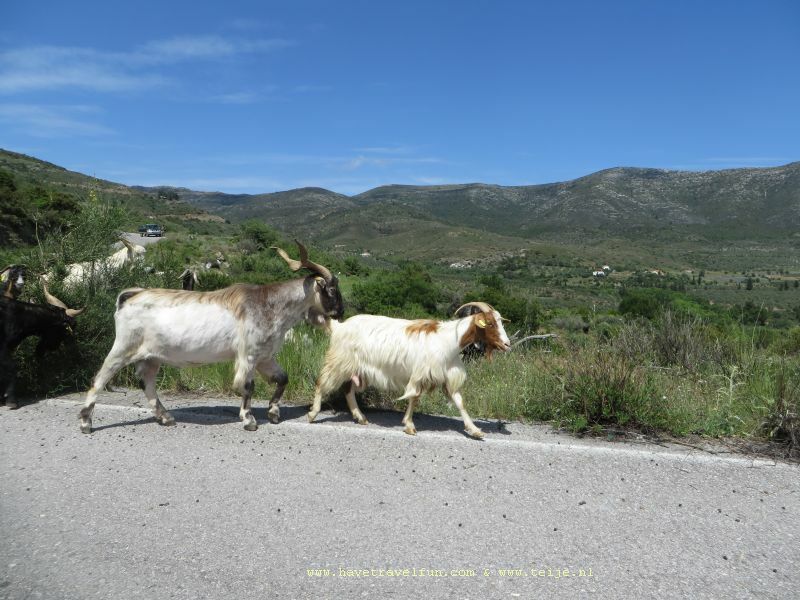 We leave Ammoudia and go to Perama near Ioannina. In itself you can get there quite quickly because there is a highway from Igoumenitsa to Ioannina. But I prefer smaller roads and at Morfi we turn and drive into the mountains. There are 3 mountain ridges in Epirus, as this part of Greece is called, and they are getting higher to the east. On the roads we regularly see turtles crossing and every time we stop to put them on the side of the road. When Elisabeth brings another to the verge, she sees another tortoise sitting there in the middle of roadside waste. 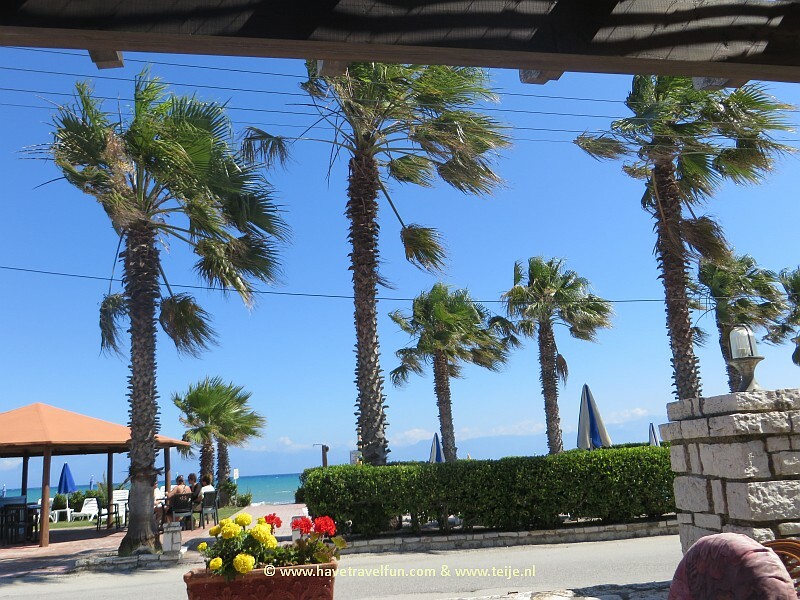 The beaches and tourist resorts are kept reasonably clean but the cleaning up of waste is not really natural behaviour for the Greeks, we have noticed, along the roads there is a lot of litter. Our first stop is in Paramythia, which according to my knowledge of Greek means 'fairy tales' but the word is written slightly differently, it is singular and has the emphasis on another syllable. According to the English wikipedia, it is one of the names used for Mary and means 'comforter'. I liked Fairy Tales better as a name. The village lies against a slope of Mount Gorilla and most people work in the large valley where mainly agriculture is located. We walk around for a while but the village is not very special. Around 1790 a large treasure with bronze statuettes from the Greco-Roman era was found but they all disappeared abroad. Only 14 figurines can still be seen in the British Museum. North of Paramytia we see the toll road from Igoumenitsa to Ioannina far below us, the Egnatia Odos which runs all the way to the Turkish border, 670 kilometers from Igoumenitsa. Part of the road runs parallel to the ancient Roman Via Agnatia that run al the way from Albania to Istanbul. This motorway is part of the E90, the European route from Lisbon to the Turkish-Iraq border. Highways are useful to get somewhere quickly, but I prefer to drive on the mountain roads where we are now. But then that road has to stay where it is! At this spot just before the village of Petousi, a road section literally slipped away after an earthquake. Where the road originally ran is now a sandy path and part of the road is completely gone off into the ravine. We come across such spots more often and sometimes even just after a bend so you only see it at the last minute. Sometimes there is even a warning sign or a ribbon, but more often not. On this road we encounter a few of those road shifts and once I even go out of the car to see if the remaining path is firm enough to drive on. The slopes here are pretty steep and the depths very deep. In the neighborhood of Typia we take the highway and then we arrive reasonably quick in Ioannina, the capital of Epirus with a little more than 100,000 inhabitants. Two years ago we were here for a few days, but we found it a pleasant environment and there are still plenty of things in the area that we want to see. Although Ioannina is located a t a height of about 500 meters, it is also very hot here and we quickly search for a terrace along the Pamvotis lake. We make an attempt to find the tourist information but unfortunately it is closed, despite the fact that a sign with the opening hours indicates that it should be open now. We walk a bit further along the lake near the medieval fortress, the center in the Byzantine and Ottoman times, but my knee is hurting more and more and now I can hardly stand on it. Very annoying, especially in a city. Along the Pamvotis lake you can find various statues and busts like that of the Greek poet Lorenzo Mavilis who fought several times against the Turks. He died in a fight at Ioannina, a year before this region finally became part of independent Greece. Greeks love their heroes, and this would have been Lorenzo's last words: I had expected honor from this war, but not the honor of sacrificing myself for Greece. The words hero and heroic come naturally from ancient Greek, and the myths from that time were full of heroes. At the end of the day we go to our apartment at Zisis Studios in Perama where we also spend a few nights 2 years ago. The owners recognize us immediately when we meet them although we did not say at the time of booking that we had been there before. Chrissy speaks excellent English (she grew up in Australia) but her husband only Greek. But at least this time I understand something more and I can also talk back a bit. I really take every opportunity to practice. Thanks to the air conditioning we have a good night's sleep and after breakfast on our balcony we go on our way to Vovousa in the mountains east of us. Along the north side of Lake Pamvotis we drive up and have a nice view of Ioannina on the other side of the lake. In the foreground you see Ioannina Island where the infamous local ruler Ali Pasha fled after the Ottoman government declared him a traitor. He sought refuge in the monastery there but was murdered anyway. He himself had also been a cruel ruler and a typical example of an Oriental despot. The roads quickly become narrower, winding and worse. We now enter the Pindos Mountains, a large mountain massif in the northwest of the country. There are several stone arch bridges from the 18th and 19th centuries that were often built by local sponsors so that the turbulent rivers could also be crossed in the winter. They are often beautiful in the landscape although this one, the Tsipiqani bridge, is right next to the modern bridge. A little past Greveniti we see a sign to 'the lake of the water lilies' and out of curiosity we drive there. It turns out to be a small pond and a large part of it is covered with the broad leaves of water lilies. Water lilies would bloom between June and August, but we only see a handful of white flowers. But it sure is an idyllic spot in the forest, we have often seen places where in the summer a lake was completely dried up, like some of the rivers, too. The more we approach Vovousa, the worse the roads become, and we have to slow down considerably. And Elisabeth is unlucky because she is regularly looking straight into the ravines and there are no barriers. But after more than 2 hours of driving we have covered the 70 kilometers and arrive in Vovousa, a Vlach or Aromanisch village. This means that the residents originally came from (probably) Romania. At present there are fewer than 100 inhabitants who live mainly from tourism and logging. When we enter the village it is just after noon and the central square is completely empty, here too everyone probably hides from the heat, even though we are here at 1000 meters altitude. The village is split by the River Aoos (but also called Vovousa) and over it is an imposing stone arch bridge that was built in 1748 and is still in use as a footbridge. The wooden railing was only installed much later but Elisabeth is happy that it is there now. Vouvousa is one of the 46 traditional villages of Zagoria, the region north of Ioannina with a rugged nature. 44 villages are still inhabited and the houses have their own style, the Zagori building style, in which only natural stone is used. New buildings are forbidden and also in restorations the house has to be rebuilt exactly in the old style. When we walk up the bridge we see that the youth of the village have sought refuge in the river to cool down. We do not see ourselves climb the steep slope to the water and walk a bit through the quiet village. The bridge goes high over the river but in the winter and spring the water is often many meters higher than now and the current seems to be rather fierce, that is why it is build so high. At the end of July, the 3-day Vovousa festival is held here, with the mountains and nature conservation as themes. We take refreshments on the only terrace on the village square and we are the only guests. Vovousa is an ideal starting point for a lot of walks through the untouched nature of the Pindos and you can even encounter brown bears. But you can also go mountain biking, kayaking and mountain climbing in the area. All activities that my sore knee does not want r\to think about. I am already happy that driving does not cause any problems. But even walking is difficult at the moment and that is why we unfortunately see too little of this picturesque village. With still a 2 hour drive ahead, we have been on the road for much of the day. When we descend the mountains again we notice that it was cooler at the top in Vovousa than down because the temperature is rising again. And in the evening we can sit on our balcony for a long time and think about what we are going to do tomorrow. And because it is again very hot and my knee does not feel any better, we decide to drive back to the coast and spend the day at the beach. We alternate that occasionally with sitting on a terrace and so we have a very relaxed day, without pictures or experiences.